The Bay State Patriot is an electronic publication of the Massachusetts Department of Veterans' Services. Mesothelioma is a rare cancer that affects the protective membranes surrounding the lungs, heart and abdominal cavity mainly caused by asbestos exposure. · Two retired Navy Veterans who provide 1-on-1 assistance with veterans and their families. · Assistance with filing VA claims to ensure veterans get maximum benefits. · Informational books and literature. · Help with finding local VA treatment centers & doctors specializing in asbestos-related disease treatment. All of the services provided are free of charge. Your comprehensive VA Health Benefits Package includes all the necessary inpatient hospital care and outpatient services to promote, preserve, or restore your health. 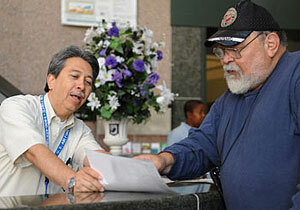 Please click here to determine if you are eligible for VA Health Care. Your service has earned your access to enhanced VA health care benefits. In order to take advantage of these benefits, OEF/OIF/OND Veterans need to enroll in VA's health care system. Don't delay, apply today! The 5-year enrollment period begins on the discharge or separation date of the service member from active duty military service, or in the case of multiple call-ups, the most recent discharge date. Combat Veterans, while not required to disclose their income information, may do so to determine their eligibility for a higher priority status, beneficiary travel benefits, and exemption of copays for care unrelated to their military service. Are you a combat Veteran and want to find out how this law affects you? What Happens After The Enhanced Eligibility Period Expires? Veterans who enroll with VA under this authority will continue to be enrolled even after their enhanced eligibility period ends. At the end of their enhanced eligibility period, Veterans enrolled in Priority Group 6 may be shifted to a lower priority group depending on their income level, and required to make applicable copays. What About Combat Veterans Who Do Not Enroll During Their Enhanced Authority Period? For those Veterans who do not enroll during their enhanced eligibility period, eligibility for enrollment and subsequent care is based on other factors such as: a compensable service-connected disability, or the Veteran's financial circumstances. For this reason, combat Veterans are strongly encouraged to apply for enrollment within their enhanced eligibility period, even if no medical care is currently needed. Certain Veterans may be eligible for more than one Enrollment Priority Group. In that case, VA will always place you in the highest Priority Group that you are eligible. Under the VA Health Benefits Package, the same services are generally available to all enrolled Veterans. Once enrolled, you will receive a personalized Veterans Handbook, which will detail your VA health benefits and provide important information concerning your access to VA health care. Under certain circumstances, family members of Veterans are eligible for health benefits. This section provides a brief overview of CHAMPVA, Spina Bifida, CWVV and Caregiver Programs. Complete the "Application for Health Benefits" at your local VA. Find a VA medical center.